HENEK’s HFS Series of filter separator vessels are designed for fast, effective removal of water and particulate from fuels and light oils. These vessels work on the coalescing and gravity settling principle. Their applications include many light viscosity, low density, and high interfacial tension liquids. 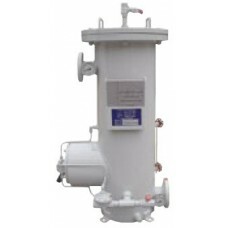 They are available in single stage vessels that are compact and lightweight for lower flow applications and larger two stage vessels for high flow applications up to 1400 GPM. Single stage flow rates of 12 to 75 GPM diesel and 25 to 150 GPM jet fuel. Two stage flow rates of 50 to 700 GPM diesel and 100 to 1400 GPM jet fuel. Standard service pressure of 150 PSI (higher on request).